Corals reefs are suffering a severe underwater heat wave this year for the third time on record, including a mysterious warm patch in the Pacific known as "The Blob," scientists said Thursday. The bout of record high temperatures in parts of the oceans, stoked by climate change, is expected to kill more than 12,000 square kilometers (4,600 square miles) of reefs, or about 5 percent of the global total, they said. The experts, including the U.S. National Oceanic and Atmospheric Administration (NOAA), said similar alerts about damage to reefs had been issued only in 2010 and 1998, both extremely warm years. Corals, tiny creatures that build stony skeletons, eject the colorful algae they live with when under stress. 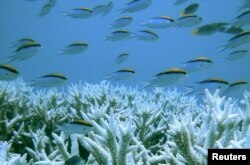 That bleaches the reefs – some corals can bounce back when temperatures fall, but many die from long-lasting whitening. Corals are nurseries for many species of fish and provide livelihoods for millions of people. "This is the third time we've had a global bleaching event," Mark Eakin, coordinator at NOAA's Coral Reef Watch, told Reuters, saying experts would have spotted such wide damage to reefs even decades ago when monitoring was less thorough. "2015 has now seen coral bleaching occurring in reefs in the northern Pacific, Indian, equatorial Pacific, and western Atlantic Oceans," the alert said. FILE - Corals and fish are seen at Australia's Great Barrier Reef, which exhibits some coral bleaching due to warm ocean temperatures. A vast mass of warm water known as "The Blob" in the north eastern Pacific has harmed corals, including in Hawaii, it said. "It is not well understood how much of 'The Blob' is related to climate change ... It's still a bit of a mystery," Eakin said. All three global alerts - in 1998, 2010 and 2015 – have coincided with El Nino events, which warm the eastern tropical Pacific and can disrupt weather worldwide, compounding the impact of climate change. On land, the "equivalent would be tropical forests turning white ... and then dying," said Richard Vevers, Executive Director of XL Catlin Seaview Survey which also contributed to the report. "The last two events have gone virtually unnoticed," he told Reuters of the bleachings in 2010 and 1998. The University of Queensland and Reef Check were also involved in the surveys. Eakin said countries could help by reducing stresses on reefs such as over-fishing and pollution. Nearly 200 governments will meet in Paris from Nov. 30 to Dec. 11 to address the wider problem of climate change.